This is an early Desert Paws project. We placed these plastic signs in hundreds of stores around the Southern California Desert. 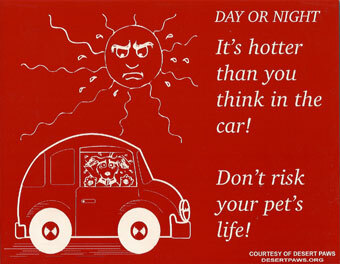 Many are still in place years later, serving as reminders not to leave pets in cars unattended. Depending where you live, this project can be adapted to suit your community’s needs. It is a great project for teens!